Entrusting your loved one’s well-being to the hands of complete strangers can certainly create many negative emotions and questions. Is the Caregiver improving my loved one’s quality of life? Can we trust the Caregiver with our loved one and their home? 24 Hour Home Care is the solution to all of your questions and mixed emotions. Our dedication and experience has cemented us as Ventura’s premier home care agency. Aging safely and happily at home allows elderly individuals to hold onto their independence while receiving the non-medical professional care they need. 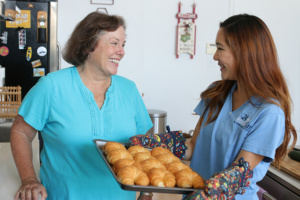 Offering a wide variety of services such as meal preparation, light housekeeping and companionship, We’ve been providing top-notch care and quality customer service in the Ventura area for the past several years. All 24 Hour Home Care clients receive a free in-home consultation where we will evaluate your loved one’s health and overall situation. From here, our associates will craft a personalized senior home care package that factors your loved one’s personality, health complications, and preferences. By synchronizing industry-leading customer service, American innovation, and cutting edge technologies, 24 Hour Home Care has created a type of home care that is unheard of elsewhere. We strongly encourage you to contact (818) 385-0227 and discuss your loved one’s situation with one of our Care experts at the Encino branch today!